Are you looking for outstanding Mediterranean landscape combined with coastal mountains plunging into deep waters and picturesque Italian towns? Let us tell you: the stunning Amalfi coast will offer you all of that and much, much more! As well as the sheer beauty of the region, you will be able to uncover some wonderful secrets of Italian cuisine while exploring charming Sorrento. But that’s by far not everything. Read on to see our top ten favourite things to do in the splendid Amalfi on our Italian cooking holidays! Lemons grow in abundance in the AmalfiCoast and can be seen on the many trees that hang off the steep cliffs. Amalfi lemons are prized for their sweet, aromatic flavour and feature in many local dishes and desserts. However, perhaps the best way to enjoy these beautiful (very large) lemons is in Amalfi’s traditional liqueur, Limoncello! While in Amalfi make sure you try some either from a local restaurant or from the many shops that sell pretty little bottles of this local treat! Amalfi has some wonderful restaurants; however it is best to aim slightly off the beaten track to get the best trattorias and pizzerias that serve traditional local food. One of the best restaurants in Amalfi is called Eolo that has delicious food and beautiful view across the bay. Their wine list is great as is their seafood. For those wanting to walk off that last bowl of pasta, there is no more beautiful place to do so than this hiking route that stretches from Praiano to Positiano. This is the best way to see this picturesque coast without having to encounter the tricky roads with its hairpin bends and whizzing Vespas! The walk is a spectacular 12km trail that is well worth the effort as the views are truly awe inspiring! While in Amalfi Coast, make the short trip along the coast to the picturesque town of Ravello. Ravello is one of the most glamorous, charming stops on the Neapolitan Riviera and is lovely place to spend the day wandering along the quiet streets of coloured stucco houses and lemon groves. Ravello is also a good starting point for numerous walks to Minori or the ancient village of Scala. No visit to Amalfi would be complete without a trip to the “blue island” of Capri. It’s a wonderful place to spend a few days, with decadent shops, excellent trattorias and stunning vistas. Set off on a traghetto boat from Amalfi harbour and spend a couple of days in this unique place. While on Capri, another great place to visit is the St. Augustine Garden which is at the top of Capri and has stunning views of the Island out to the sea. If you beat the crowds, this garden is a lovely quiet place to relax and take in the views. 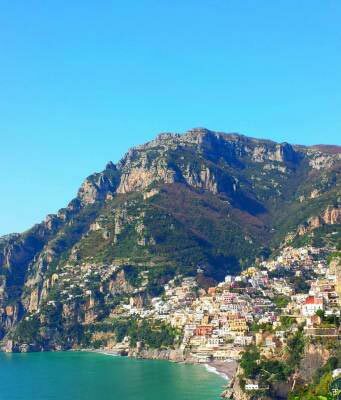 Visits to Positano and Sorrento are not to be forgotten on any trip to the AmalfiCoast. On our trips to Amalfi we never miss a visit to these charming towns. With Sorrento’s position straddling a cliff, and Positano with it’s steeply stacked, colourful houses; you will struggle to find two more photogenic towns. Eat Pizza in Naples! Pizza originates in Naples and so wherever you are in the city you are never too far from a Pizzeria. Perhaps the best place to go is L’ Antica Pizzeria da Michele who have been making pizza since 1870 and so by now they know what they are doing! Once you have seen how it is done, make your own back at the villa on our cooking holidays! While in Amalfi the cathedral, known as Duomo di Amalfi, is an incredible piece of local architecture. The Cathedral has 9th century origins, but has since been remodelled many times and so features Arab-Norman Romanesque, Byzantine, Gothic and Baroque elements. The Cathedral sits atop a grand staircase and the interior is so magnificent it is worth poking you head in. 10. See how cheese is made! Visit an artisan fior di latte (mozzarella cheese) producer. On our cooking holidays to Amalfi we visit a local mozzarella producer where you get to see firsthand how this delicious cheese is made. See how it starts from a drop of milk to the finished product that you will get to taste. Squisito! The Amalfi coast is always worth a visit, and if you love Italian cuisine and Italy’s breathtaking landscape – be reassured: Amalfi is the place to go. So, if you are planning your holiday in Italy and are looking for an authentic experience, then check our cooking holidays in Italy. If you have any worries, concerns or simply would like to ask us a question – then do not hesitate to contact us. Our experienced staff will be more than happy to help you!